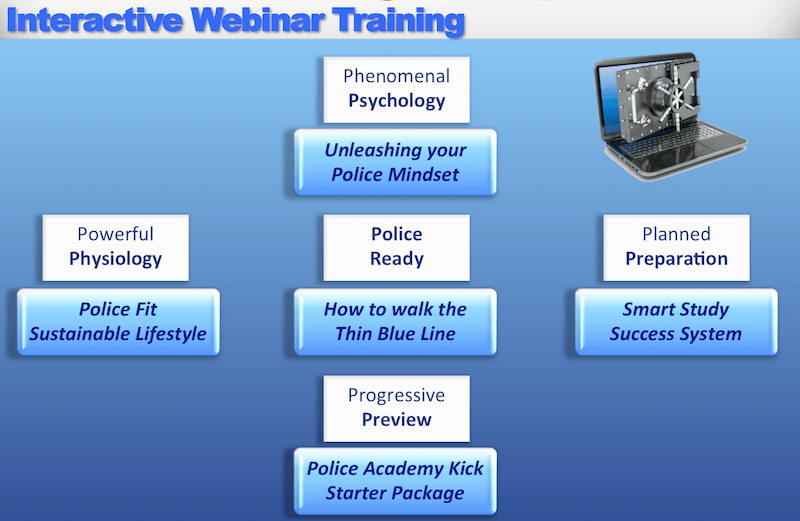 Because you ordered the Police Mastery eBook AND Online Training System package you now have a special opportunity to upgrade your order to give you the ultimate edge at the Police Academy. ​So before you go though to your training area, we'd like to offer you a significant discounted access to our popular Police Academy Secrets ﻿Video﻿ Training Series. Although your successful selection into the Police Academy is a critical step, it is also a relatively small step in comparison to the ultimate achievement of becoming a competent police officer who also enjoys a high degree of fulfilment in their role serving the community. Plus if you are selected for the academy, you may only have a matter of weeks to make final preparations before your first day amongst a sea of other successful applicants. I personally had a fairly shaky start to my police academy training but was able to turn things around very quickly and finally graduate with multiple awards including highest performing recruit (DUX) and also the most contributing squad member (Police Minister Award). This course is the result of my personal experience in the academy and is designed to save you from many of the mistakes I made as well as the errors I saw fellow recruits making along the way - which in some cases resulted in their removal from the course! This video series is designed to set you up for long-term success by establishing some fundamental routines, habits and techniques that will prepare you to not only graduate, but to do so with a much higher level of competence and confidence. As you can see in the course overview below, there are five key aspects that you will benefit from sorting out before you even arrive at the academy. A six step system which will enable you to develop a highly resilient approach and way of thinking that provides you with clear steps on how to best assimilate what you learn at the academy – all whilst maintaining an objective, yet empathetic mindset in the face of common police challenges. You will also learn how to boost your psychological resilience prior to facing the complex challenges of police academy training. This is a four step system which takes you right the way through from pre-study considerations to specific study techniques to final exam preparations. Here you will be taken through simple step by step procedures on how to break through previous cycles of procrastination and how to identify what type of study works best for you. This is all about creating your own personal study plan to ensure you can learn as much as you can with the least amount of effort. Here is where you get access to the heart of the Police Academy Blueprint 2.0. This is laser focussed presentations on specific components of police training. You will gain valuable insight in how to best prepare for a number of topics including scenario training, legal training, driver training, tactics training, communications training, police procedures and more. You may be wondering if you have the energy and motivation to actually apply yourself to the degree required for successful graduation. So in this component you will learn how to really tap into your own personal circumstances and optimise your lifestyle to high levels of energy on a sustainable basis. This is not about giving you a quick burst of temporary motivation. You will be learning how to bring the mindset of the marathon runner to your everyday life and transform into the most energetic and enthusiastic recruit you can be. This bonus video is all about making the successful transformation from civilian life to life in the police service. You will learn some very confronting facts on awaits those who “fall off” the tight rope that is the “Thin Blue Line”. Depression, financial ruin and social isolation are but a few of the experiences that befall far too many men and women in blue. You will discover some critical considerations and steps to take to go beyond the initial ‘Police Mindset’ and into a position of incredible resilience that will allow you to enjoy your dream of becoming a police officer – rather than the ‘job’ that it becomes for so many others. So how does it work? And what does it cost? When we first released this training, the price for live access to the weekly webinars was $497.00. We now sell the replay of the course on for $299.95. This is the current price on the website. You will get access to the full course immediately as well as some hidden bonus videos I haven’t even mentioned here (these include topics of recruit relations, effective habits of police officers and some additional computer system training). Plus you will get access to a special PDF access files with each week’s content in summary notes for you. The videos remain in your account too, so you can go through the training at your own pace.